All my life, I have struggled with Arabic. At age four, I spoke four languages. This means I was familiar with my parents' native idioms and was fluent in my academic French language and the language of the masses: English. 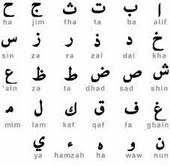 Fluency in the Western languages exacerbated any attempt to acquire an ancient and stern language: Arabic. Farsi appeared as free flowing and friendly in comparison. My mother did her utmost for us to learn our father tongue and I have her to thank. She got us private lessons three times a week! I studied with a teacher from Zahleh and another Druze teacher. They passed on their accents, their stories, their grammar, their script, their dictations, their language. 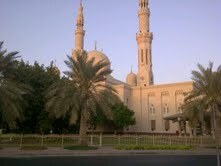 An additional three years in Geneva with a teacher I still hate today followed the ten years of tutorial in Dubai. All those photocopies of Arabic texts to read, translate and dissect! All those expensive hours gazing out the window at the clouds.....but I managed to pass the Baccalaureat Arabic exam in France with flying colors. I finalized with a two year stunt at the Arabic department at the University of Geneva post Phd ! 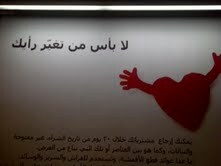 All those efforts, and I still couldn't read Arabic instinctively. Not till I had my third son. His intuitive personality and his sense of humor and interest were the facilitators of my learning. I learned Arabic by teaching it to him, by practicing it with him. And I loved the process. When I made the decisive contract to speak to my two year old in classical Arabic, my language fluency was equivalent to that of a two year old. My vocabulary was restrained, my accent heavy, my mistakes remained uncorrected. Three years later, hours of conversation and tender maternal mingling past us, we both can be considered fluent Classical Arabic 5 year olds. 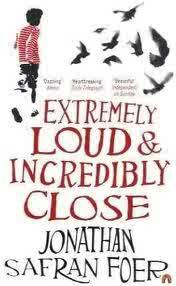 I have read the books with him, added the vocabulary and sometimes corrected the Arabic. 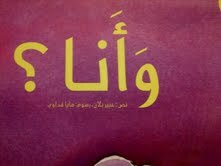 When I give my son the choice between an Arabic book and a French/English one, he always chooses the Arabic one. It is our secret language and a source of fun. I may still stumble in my reading of small paragraphs but it has improved! Like my son who has learned to read French on his own (since I barely ever read it to him) and sees signs all around the city to be read, I have also reached the stage where Arabic street signs and advertisements speak to me now . They no longer look like Chinese characters. I have found beauty in my language....finally! 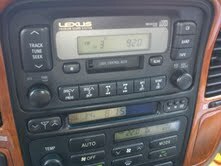 "My heart's a stereo...." The tune begins this way and it plays langerously and ad-nauseam on the radio. My girlfriends and sister love it. I switch channels when I hear it. But I must confess: my heart is really a radio. I get into the pinktaxi, buckle my kids up, start the car and my finger goes straight for the stereo. We surf on four channels. There is a modus vivendi, where the four of us are very much on the same wave length and we agree to switch channels. No family would zap this harmoniously through TV channels for example. However, when it comes to music, we beg to concur! Dubai's DJs except for Nathalie and Mo are all British! Set aside their accents, their particular sense of humor and listen to the music: it rocks! I was telling my aunt and she disagreed. She said it wasn't alternative enough. For that, stay locked to 92FM. I certainly am a fan of alternative, college style music. But I must say that I am not averse to mainstream as I pretend to be. I may even have posted an entry about Rihana and Enrique (how embarrassing but I still think he is a heart throb). They play Eminem's song with Bruno Mars at least a dozen times a day and since I drive every shift, my heart squeezes every single time I recognize its first notes. Every single time, no fail. The other day, at UEnergy, with the DJ in the house (how cool is it to work out with a DJ spinning? ), they asked me if I had a request, knowing how enthused I am by music. I hesitated. 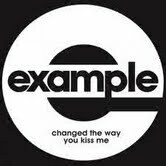 If I asked for EXAMPLE I would sound mainstream so I gave the standard response: "its all cool. Nothing comes to mind." It was 20 mins through that my brother muffled my scream: aaaaaaaaah! They are playing EXAMPLE and mixing it. Did I tell you I didn't know how to run? The music sent me direct to the treadmill on 11 speed! Mainstream music can be fun...."There's a stranger on my bed....pink flamingos in the pool" I hum Kate Perry to everyone's surprise! I can be full of contradictions. 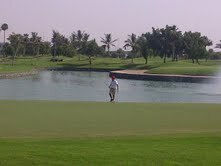 Most people take up golf because its a networking game, a social activity, centered around the game and the apres-golf. I have benefited from that aspect of it, playing with acquaintances, then turned friends! 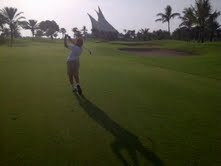 However, and excluding the principal reason of becoming a "golf-mom", I have learned golf for myself, for my ME time. I may take "ladies morning classes" at the Golf Creek Club. I often recruit a friend to join me. Its good quality time spent together. Yet, non of my friends to date have really gotten the "golf flu" which translates into constant practice and play. I therefore escape, in solitary, on the small par3 and play on my own. What a relaxing feeling! I recommended swimming to a person with back pain. He complained: "but it is such a solitary sport." I smiled in delight because I really love solitary sports. I know that I swim because it is my own time, alone, the only sport I can perform without guidelines, instinctively: laps after laps. I enjoy my solitary games. I run at my own pace. I enjoy the silence. I think of my independence. It is a luxury to know what to do when you are alone: a freedom! 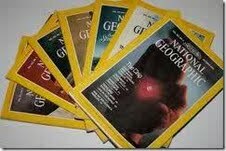 Does anyone remember the yellow binding of the National Geographic Magazine and the way relatives subscribed and collected them? They were rather small in format considering the fact that it was intended as a photography-magazine. Perhaps it wanted to contrast with Life Magazine, a generation preceding it, thinner but larger. Either in Beyrouth, Dubai or Tehran, I had access to the National Geographic Magazine because my uncles or grandfather collected them. They encouraged us to leaf through it, and since there wasn't much distraction, I actually did. I think all my green images of the Amazon, the depths of Africa, the icebergs of the North Pole came from the NGM! The Seventies passed and the NGM subscriptions became less and less in demand despite the constant prices. In the 80s, only my grandfather received it in Utah and they were always scattered in his medical office. I no longer looked at them: was it that I had grown up or had my priorities changed? I will admit to a momentary lapse in intellectual reading: my father gifted me with a subscription of Paris Match for two or three years at boarding school. My girlfriends rushed to read my issues: always after me, lest they ruffle the pages of the weekly before I read them. I loved the Diana and Stephanie sagas! My life changed when I discovered Le Monde. I used to read the back issues at the libraries in university in the USA because each issue cost 5$. In Switzerland, my children learned very quickly to go to the newspaper kiosques and pick the issue for me, before they knew how to read, by simple font recognition. LeMonde turned me into a media snob. 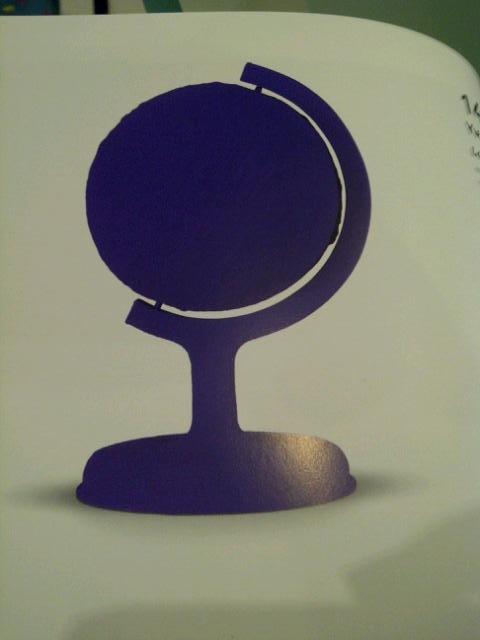 I rejected the International Herald Tribune, not to mention La Tribune de Geneve or Khaleej Times! Now Vogue and Elle appeared futile and Vanity Fair turned into an occasional plane ride read. I did go through the yuppy phase of subscribing to Travel and Leisure and actually read about the spas and hotels with serious interest. But I soon discovered it was all a marketing trap and I tossed the back issues into the recycling bin. Today, seven years in the making, I have become a Canvas Magazine reader. I await each issue with the same trepidation I did the Paris Match, I study it with academic attention and I refer to it frequently. My children have seen the issues, they know I store them with care for easy reference and it has become the "National Geographic Magazine" of their era. Perhaps because our priorities have moved from the far flung rain forests and glacial deserts to the art studios and galleries of the Middle East. I have never had a pet, except for fish, for a few months. Why I got interested into aquariums, I don't really remember. In the 90s, I went to Sharper Image (does anyone remember that store?) and bought the slick, circular type aquarium that I set on the wall to wall carpet in my home in Boston. I could lay down on the floor and stare at my fish while I studied. I bought a dozen and called them P.M Dawn, REM, Depeche Mode. I had to change the water, make sure the filter was working, buy them fish food. The cohabitation was successful. For a semester. Then I traveled for a week. And I thought the fish would survive if I left them with a lot of food floating on the top of the water surface. When I got back home, I was confronted with the laws of the sea: the big fish eat the little fish! There was a single fish left: I think it was Amr Diab! He was swimming his monotonous circular movements around the tank with fish carcasses left at the bottom. I took a net, caught him and decided to give him a Guantanamo punishment (in 1992, before Guantanamo existed). This consisted of putting the net in and out of the water, in and out, in and out.....till I flushed him down into the sewers of Boston. He was guilty of mass murder! 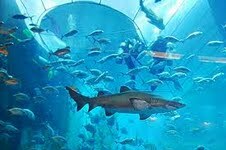 I didn't want to hear about aquariums till the largest, vastest ones came to us in Dubai. 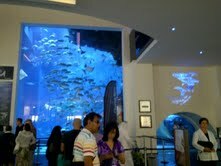 At Atlantis and then at Dubai Mall. 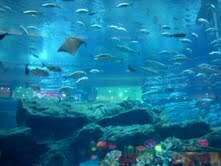 Those aquariums fascinate me. 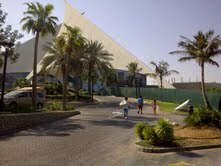 I never pass by them without stopping, without looking at the fish, the sting rays and the sharks. 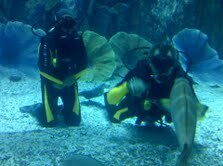 I had seen divers and I assumed they were marine specialists, managing the tank: cleaning it, feeding the fish and the sharks. So that the big fish don't eat the small ones and the same fiasco that occurred in my tiny Boston tank, happen in glitzy Dubai. Well, I am one of those divers tomorrow and I paid for the experience. 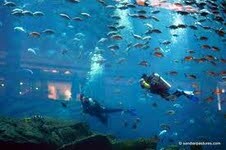 Dubai has three gimmicks: one of them is you can ski indoors, the other is that you can swim with the dolphins, the third is that you can dive with the sharks. Most people, if at all, stop at the first two. My younger brother has pushed himself, and me in tow! Happy our uncle, who is nothing less than Indiana Jones, is coming with us too. If he thinks this is a thrill, then I am in for a big surprise. My brother's dare didn't surprise me. 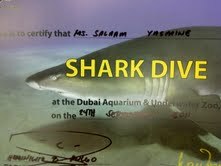 He had once given me a Bill Clinton smile and offered: "after we get our diving license, we could dive into the Dubai Mall tank." I laughed the idea out because at the time, I was still practicing in a pool so the prospect was very far. 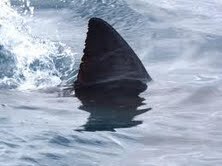 How many times have I hesitated to swim at sea lest a shark fin surprise me? How many times have I imagined those evil fish lurking in the distance? How many times have I woken up my mom as a child because of a shark dream? 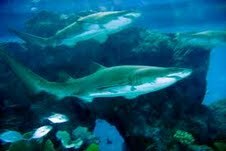 Some thirty years later, I am jumping into a shark tank because my children will be watching and because I am a blogger. My fear is inferior to the desire to overcome it for my kids sake. So they don't have shark nightmares. When I told my cousin I was diving with 20 sharks, he replied: "make sure not to scare them!" One thing is for sure, next time Camille LaCourt swims at Fort Boyard, I could be part of his team. I don't go to a pilates class with the same demeanor as when I go to the gym to pump iron. 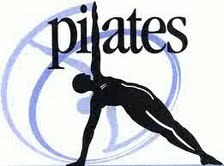 In fact, my approach to pilates has changed my approach to all sports, be it golf or gym activities. I listen carefully and I maintain good posture. In fact attending pilates class is a quasi academic experience. That is because I practice it at Club Stretch which teaches Classical Pilates, following the Boulder, Colorado program. I would even venture to say that the program is followed in an Orthodox fashion, with its very strict rules: we respect the choreography to the minute detail. Who says Orthodox, doesn't say rigid and unchangeable. I have modified the Elephant position, probably 3 times in the course of my six year study. We have gone through different phases on the mat, initially starting with standard yoga like stretches in 2004 that I have not repeated since in the pilates studio. Instead, we go straight into the repertoire. The repertoire, is without a doubt, as classic as it gets! I never cease to question the mysterious attraction, turned into passion, that lures me into the studio three to four times a week, year after year after year. I do not have the scientific inclination to retain anatomical terms nor to comprehend the laws of physics (both required in the studio). I have never had the grace or the understanding of choreography known to dancers. Always and constantly, I am made aware of those unknown dimensions, with precision and poetry. 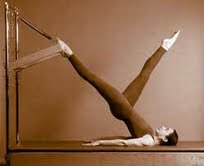 I have just to glance at my fellow pilates practicionners who perform extraordinary movements and at a cadence I am impressed with. Meanwhile no other than I gives a surprised look. I think I will always be impressed by the milieu I landed in, somehow or another, six years ago. Its comforting to think that I could join any professional pilates studio in the world and fit right in, because I am a graduate (in the loose sense of the term) of Club Stretch in Dubai. The same applies to Bikram yoga, which is taught there. I was in Santa Barbara, CA, when I told my husband: "stop the car, there is a Bikram studio!" 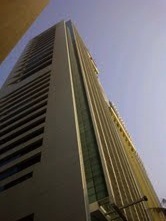 But then I thought: "it wouldn't nearly be as fun as Bikram in Dubai!" It has been 10 days since my son has become a Junior member at the Dubai Creek Club and we have both have the "new recruit" fervor. Not only must I drive the golf buggy as he is too young to drive it, but I get my share of guest and summer discounts! September temperatures remain unpleasant in Dubai, but neither one of us cares, as my son is a golf fanatic and I am a Bikram Yoga junkie. Yet it was him who wondered why I was wiping my face: "I thought it was good for you to sweat, that it cools you down and no need to wipe!" he paraphrased a yoga instructor I know too well. 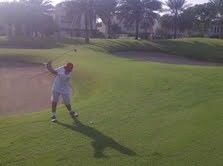 The single reason I started golf was to accompany my son in his game and practice. He has a year more of experience and his level is tenfolds better than mine. Playing with him on the large courses, partnering with him in small competitions and even acting as his caddie or plain supporter, has stretched the limits of my patience to the extreme! But I have to admit, his behavior on the course has improved a lot. At first, and this more due to his competitive edge than to his lack of maturity, he used to cheat: count his points wrong, or ask to play another ball. He used to use the T on the fairway! He also ignored etiquette, played ahead of the other unfortunate players who played with us, walked onto their putting line.....and the list goes on. One very bad habit he had was to prize each and every golf ball. It was inadmissible for him to loose a ball and if he did he would score for it and put me to the task as well! That has changed this year and we have lost our "lake balls" by the bagfull now, but have gained in time! He still doesn't rake after his ball falls into bunkers, which happens less frequently on courses he plays regularly. He begs for me not to count the ball that falls into the water hazard and he doesn't stand still when its my turn to play! But those idiosynchracies aside, he does "transition" well to save time, because the game must be "choreographied" to be played in good timing. He selects his next club, takes his putter out ahead of time. And all along, his constant enthusiasm. And his constant tips. It is safe to say that it is a learning experience to play with MY junior! My friend, the Goncourt laureate and one of the finest spokesperson for Afghanistan, Atiq Rahimi, wrote an essay for Vanity Fair October 2011, about Time. The tone may sound anecdotal and light for his Vanity Fair audience but the author did sound profound and philosophical as well. A proof that a vignette (or a blog) can sometimes carry its weight as it has done in this instance. The underpinning reasoning of the essay is cultural relativism. In Afghanistan, Time is valued and respected at a different rythm than elsewhere. Thus, the Afghan thinker has a different tempo and different expectations than his Western counterpart. "I have been observing through the hole between two stones for ten years and my expectations and my patience are extensive" I paraphrase the Afghan thinker in Atiq Rahimi's anecdote. On the other hand, the Western thinker in that story, impulsive and in search of easy gratification, steals a glance and in his impatience abandons the observation. 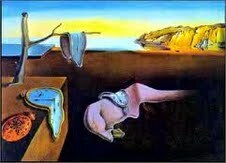 For the Western thinker has been educated to value time as precious and fleeting. On the other hand, the Afghan thinker believes time is generous, extensive, non-perishable. I have been raised in an educational system where time is compartimentalized, routinized, made precious. My Levantine mercantile culture has nurtured me to believe that time must be made productive. My family culture and perhaps my own temperament have made me believe that time would be on my side if I respected it, if I thought with efficiency and handled Time with brio. Language has influenced me. I have been instructed "not to waste time" in English, further increasing the value of a limited Time. In French, the same idea "perdre son temps" translates literally as "loosing time". In the country of Marcel Proust, Time is fleeting and the lost Time generates much nostalgia and melancholy. In contrast, as a yoga adept, I have learned to live in the present and I strive to experience a sense of zen. I always conjugate Time in the present tense, only throw a glance at the past and plan for the future by building a steady and strong present or foundation. Every morning is a January First and every moment is an opportunity to seize! Everyone who has been to NYC has a story, a memory, and an impression. A recent guest blogger's own authentic experience created a domino effect of commentaries because NY is a source of story for many. Jonathan Franzen's Freedom pays homage to JD Salinger's Catcher in the Rye, with the coming of age of their protagonists in the city. 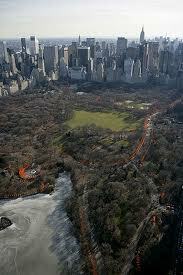 The best Woody Allen movies are those that are shot in his city, Manhattan. There is no separating Jerry Sinefeld from his city as well. I love New York because all my siblings and my husband have called it home. I have stayed with my bachelor brothers for a few weeks, and have rented a furnished apartment with my first child, for a month, in October. I remember celebrating Halloween with him. He was predictably dressed as a fireman. He knew how to hail yellow cabs with a Farsi "Taxi biya!" Today, when we watch the sun set at the beach in Dubai, I simplify geography for my kids and tell them that the sun is rising in NewYork and that their cousins are waking up. My youngest identifies NY so much with his cousins, that he even looked out for them in the film Smurfs, which played in their city. My sister's younger son, who is turning 3 today, is an all time natural NewYorker. It won't be long before he will hail a cab himself to go to the best restaurants, the museums, the boutiques, the shows, the investment banks, the law firms, the hotels, the gyms and the universities. 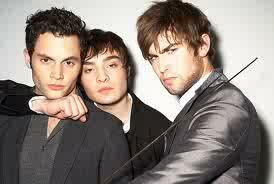 I always refer to the guys of Gossip Girl when I think of them. I also know that there will always be a reason and a pretext for me to go to NYC, because I am related to four true NewYorkers! My teaching experience is all tutorial. While all my students were related to me, siblings and children, I still pride in the accomplishments. My siblings have passed their SATs and my children have been home-school with the CNED French system for at least four years! Yet, I discovered the wonders of group class last weekend when I decided five children between the age of 4 and 7 should "work" on an Art Project by this very demanding CNED program. Granted 5 children is not considered a conventional class but I had the pleasure of watching my own children and their friends follow my instructions in a subject I don't know anything about, except for having read the "teacher manual" that CNED sends to the tutors. I would not have been able to attain the goal required, nor enjoy the process as much as the children did had I taken brush and paint palettes and worked on the art project myself. I took out the gouache paint tubes, selected dark and light blue. The trick was to discover the complimentary colors. 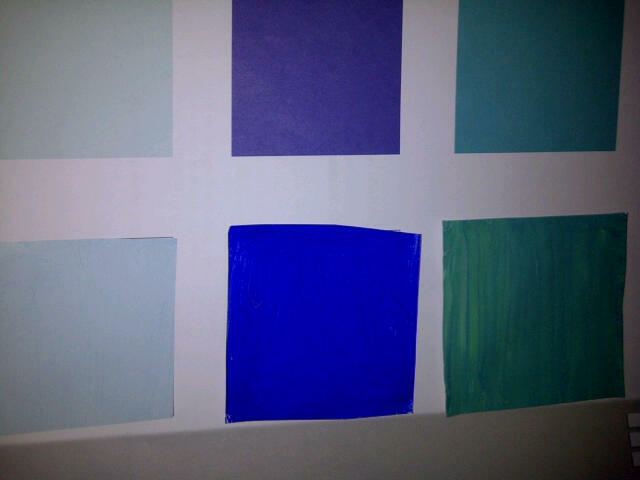 I spied on the teacher's manual: brought out some white, some black and some green and the experiment with blue began! 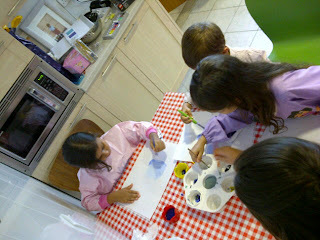 Unlike sciences, in art there is no right answer and all artistic endeavors (at least in primary school) are laudable. What a sight to watch the artists seeking the secret blue hue of Yves Klein! 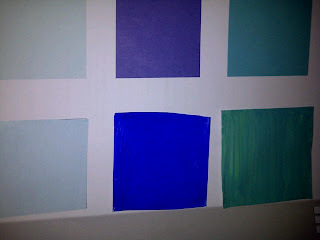 In the end, few did find the various shades of blue. There was a large deal of creativity and fun. A single student, Maryam, lingered with the colors, wondering about the mysteries of turquoise, diluting with water, adding a shade of white or green. She asked me: "I wish I had an artist to ask, how do you make turquoise?" 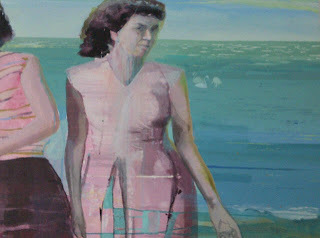 I took her to Mehdi Farhadian's painting, and told her: "I stare at the various shades of blue and wonder daily." Inquisitive Maryam won the competition of blue and deserves to meet Farhadian soon. My mom recommended two classes on my freshman year at Smith College: Art History and Music Appreciation. I ended up buying her a t-shirt that read: I survived Art History 101(that became my most memorable class ever). However I didn't listen to her about Music Appreciation, and that remains an academic regret (I do have many others). Music matters. I sensed that from the time I became a fan of Madonna, and after that when my youngest maternal uncle introduced me to Depeche Mode theCure and Pet Shop Boys. 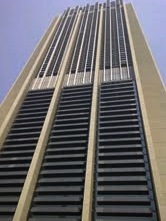 Today, at the helm of my "pinktaxi", my children sometimes catch me screaming in delight: "they are playing Example!" And none of us get out of the car, even after we have reached destination, in interruption of Eminem's latest. 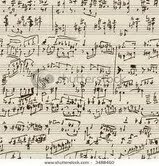 Music we all appreciate, but not necessarily in the technical terms. Indeed, we can recognize the violins in Cold Play's Viva La Vida, and we hear the background tune in Eminem's Sky Full of Lanterns, but those are almost obvious. My youngest may have a musical ear, he can hear the Emirates Airlines ring before the advertisement starts (and we always fly Swiss). But he is just beginning violin lessons, so only time will tell. When we need any musical advise or approval, when my son works on a music project, we call my eldest brother who, with a musical ear, with years of piano, and with the maternal recommendation of "take a music appreciation class" respected, can answer all our musical inquiries. And thus school year upon school year, my children and I spend the majority of the time dedicated to "home schooling" on the music program, which is a quasi elective. Even sciences appear easy in comparison. My youngest is in the first grade, and the "home schooling" program from France (CNED) requires him to listen to the various sounds of water. Indeed, listening to the sound of water, is the first lesson in Music Appreciation! My pilates instructor handed me the Inner Game of Tennis at a time when I was questioning every movement in the studio, and worse asking him the questions. Reading the classic by W.T. Gallwey did curb my enthusiasm, so to speak, because it quieted the inner voice that remarked my every movement. I therefore thought it wise to acquire the book "Inner Game of Golf" by the same author, in order to fix my mental game at golf. I also chose to read it at the beginning of golf season, in September. I am halfway through, reading it more carefully than I did The Inner Game of Tennis because I haven't touched a racket in decades and the point was to get the gist of it and apply it to pilates. In this case, ITS ABOUT GOLF, and if I continue to read it, I will only obsess more about a sport that runs in the family, from my father's generation down to my children. However, the whole principle of the book is to quiet the mental game and play like the Nike logo: Just do it. That is at the essence of it. Paradoxically, the author gives us many tips about how not to play the mental game. I therefore take those tips and attempt their application during the game. For example, he suggests we keep our eye on the ball and the small amount of grass between the ball and the club face: I find myself staring at the grass till it hurts! He tells us to hum when we drive, so we don't clench the club and he advises to empty our heads of any technical corrections. He also recommends we never give in to self doubt or listen to self-criticism. I T- off and I remind myself to hum, I reject self doubt and get cross at myself for having an opinion about my game. That in itself are three mental activities that distract me! Perhaps the only advise I do heed is to relax between holes in order to concentrate when playing. That method I call savasnah in reference to the short moment of relaxation between poses in yoga. I also, and perhaps again in distraction, think of Roger Federer when he sits between sets, eating a banana, or drinking water, and empties his mind. I can tell from his body language that he is relaxed. But can that inspire me at golf? We all know by now how New Yorkers can stick together in difficult times, but they are also known to like their private space and to mind their own business. Neighbors don't have dinner at each other's homes, and most of the time we keep to ourselves to avoid awkward situations with people. We keep to ourselves mostly because we all know that New York has some of the most eccentric and odd people in the world: overly made up bag ladies, neighbors who have 10 cats, the men with tatoos all over their bodies, people with Turette's syndrom cursing on the streets, amongst many others. These people are part of our society, and even my children have learnt to accept them and not fear them. So just the other day, I stepped on the 6 train going uptown, to pick up my youngest from school. It is an unspoken rule on the subway to mind your own business, not make physical or eye contact with anybody when possible, and let your mind go to your book or your day dreams. 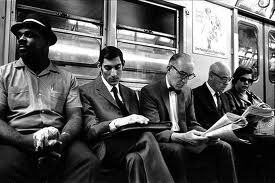 We all get off and on the subway trains, in such a hurry and usually never notice anybody around us. However this ride would be different... A few stops into the ride, 3 Rastafarian men, with djambe drums and little chairs step on to my train car. This happens often, where they perform for the riders and hope to make a few dollars. I usually welcome this entertainment because they are often quite talented and the music is a pleasant break from the monotony. "Good afternoon everybody" says one. Of course, as true New Yorkers, nobody responds, averting their gaze. "I said good afternoon everybody" he says again, this time louder. Maybe 3 people mumble back "good afternoon". "Some people need to learn their manners". 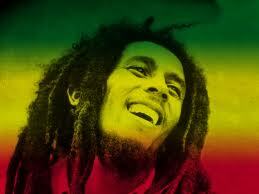 He says, but not in a threatening way, more in a cool Rasta man tone. "All I get are 3 people to respond to me. Man!" A few people giggle, I smile. He then approaches an Asian-American woman, sitting gaze averted from him. "Usually Asians have values and know about respect. But you've been too long in America"
"You don't know anything about me or Asians." "Yes I do. And you have been in this country too long." She rolls her eyes and looks away. So he starts singing, and of course it's catchy. I can't remember which Bob Marley song it is, but it was one of the happier ones. And before I can do anything, Rasta Man number 1 throws a maraca at me, and tells me to shake it to the beat. I look around me and everyone is smiling or laughing. 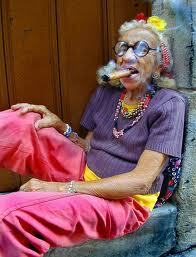 I especially didn't want to get lectured by the Rasta man on my lack of "joie de vivre". And then, I thought of my boys who shake maracas in their silly music classes. For what? So that maybe one day they will be able to perform as I did on a subway car? The absurdity of it all made me comply. So there I was, shaking to the beat till the next train stop. "And a special ovation for the maraca lady!" 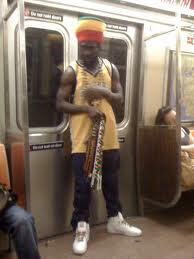 Everyone clapped and laughed, and I turned bright red, so embarassed was I of having performed on a NY subway car. I guess there is a first for everything, right?